Handbrake cable replacement - how piggish a job is it? Biggest headache is the connection of the two handbrake cables to the handbrake lever spring system under the car between the petrol tank and a cross brace. Once you have taken off the brake shoes, you can unhook the cable at that end, unclip it from the clips on the DeDion tube. Then you have to push the centre of the cable up into the outer as far as you can, so you unhook it up at the handbrake lever end. And fitting a new one (or refitting a used one)? The spring looks pretty monstrous. Does it need to be compressed to accept cable(s)? (I seem to recall Tolsen fabricated a tool for that). (I seem to recall Tolsen fabricated a tool for that). The ubiquitous statement of the year. Inboard end, two different makes of hand brake cable shown. Outboard end. Also two different makes. The chance is steel catches on outboard ends have disintegrated into dust so knocking them loose with hammer and punch may release their outer casings. Special handbrake casing steel catch release tool made from Massey Ferguson 35 hydraulic pipe and 6mm round Soviet bar. View of inboard catch on handbrake cable casing. Note I used a special Lidl dental inspection mirror to see catch. Final version of handbrake cable outer casing catch release tool. Hand made with great pride in Scotland. Last edited by tolsen; 21-04-2018 at 11:15 AM. Thanks everyone. Off to have a look and see why NS HB isn't working - and if cable is the culprit. My 450 passed MOT this morning. Less than 2% difference between left and right drums when testing hand brake. Obviously due to my diy fix of the brake shoe linings. I debonded all brake linings and swapped them around to compensate for wear. And the cable is the culprit - seized. Removed at outboard end be lightly hammering the end of the outer sheath whereupon the tangs bent double then broke. Is there access from above (from inside the car) to use this method on the inner end? If so, with or without removing handbrake lever and if handbrake lever is to be removed, does the carpet have to come out? I am only aware of two methods to release inboard end of outer casing: 1) Lower rear subframe sufficiently to provide access from above. 2) Use my special and much coveted tool. Alas, I will not be using your much coveted but in a different shire tool. But, it seems that to remove the cable at its inner end I will be working from above - on a car with no aircon. 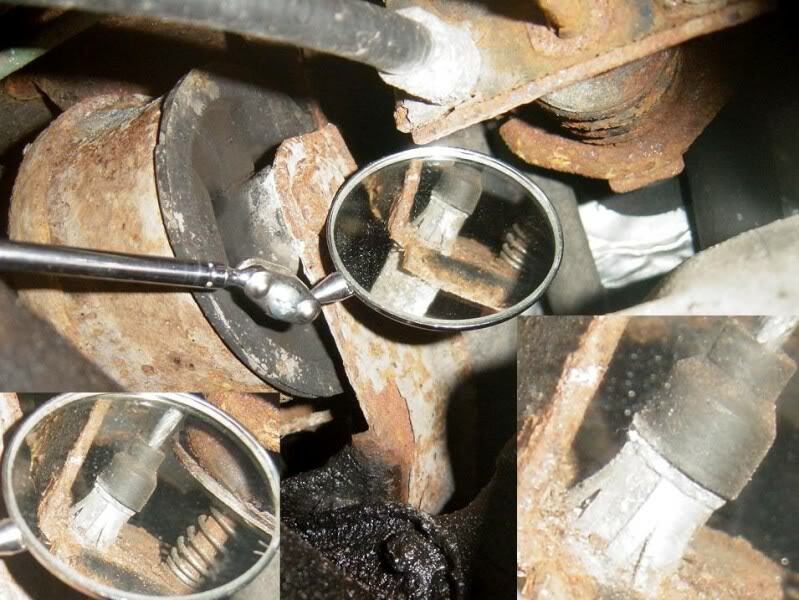 Possible without lowering the subframe?